Sky’s just announced a late addition to SoHo’s schedule: this Saturday at 8.30 it will air Beyonce’s HBO special, Lemonade. The New York Times described the hour-long “visual album” version as “a quick-cutting music video that intersperses the songs, and broadens them, with compelling poetry from the Somali-British writer Warsan Shire, poems that often extend women’s physicality toward the archetypal. “As Beyoncé recites them, Ms. Shire’s words radically reframe the songs, so they are no longer one woman’s struggles but tribulations shared through generations of mothers and daughters. “The video is filled with images of female solidarity and of family, Southern and African roots, women of all ages and roles and eras. “Often, Beyoncé is joined by African-American women in white clothes enacting shared work, gatherings of women or eerie communal rituals. “Beyoncé, in multiple hairstyles and fashions, is shown both alluring and unglamorous: hard-faced, unhappy, sweaty, harshly lit. 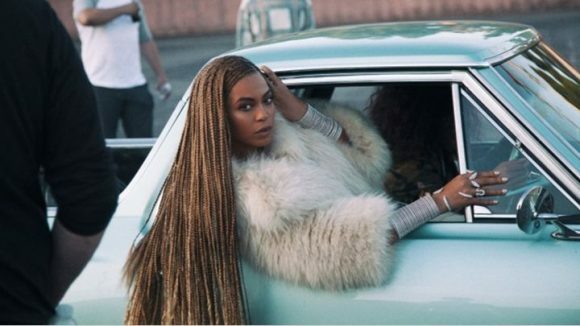 The Huffington Post dubbed it “a captivating 12-track visual album that immediately made the world graciously bow down … a series of music videos creatively strung together through spoken word, stunning imagery and searing lyrics that only Beyoncé could deliver so beautifully.